Here at Hair solved, working with extensions it is essential to us that any products we use keep the hair extensions looking their best at all times, and even more importantly, any products we use must make washing easy and manageable for our Clients. We recommend that when shampooing their extensions or Enhancer System, all our Clients use a shampoo and conditioner that will add moisture to the hair, as the extensions often miss out on the natural oils that your scalp produces for your own hair. 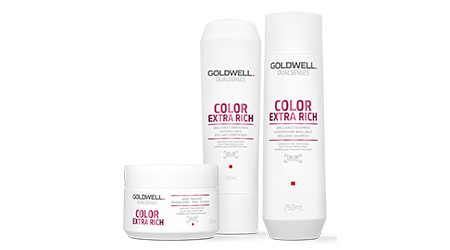 Goldwell’s colour extra rich boasts an unique Fade Stop Formula with a rich cream foam which mildly cleanses the hair, is gentle to coloured hair, or has excellent hydrating qualities. The added Raspberry Seed Oil not only provides a luscious fragrance but is an essential ingredient due to it’s hydrating abilities. The Shampoo which forms the base of the range isn’t heavy and wont leave your hair feeling lank with product built up, the product is highly concentrated so you need only a small amount of shampoo to give you a great lather, so it tends to last a lot longer than similar shampoos within the price range. You should always follow a shampoo with the same brand of conditioner. Goldwells colour extra rich conditioner not only intensifies colour brilliances but helps to detangle hair effortlessly. For a little extra treat for your hair, we highly recommend the 60 second treatment conditioner, with helps to give your hair the TLC it deserves. The 3 products which complete the line up are really all you need for your regular hair care routine and are available directly from your local Hair Solved. If you have any questions about these or any of the other products Hair Solved recommend, please contact your Hair Solved stylist.